Made a spontaneous trip to the Philadelphia Zoo this past weekend. 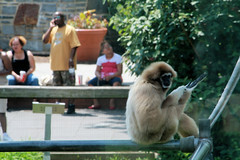 Anyways, I was inside the Primate house at the Philadelphia Zoo and shot this looking behind glass. This "primate" probably has some fancy scientific name for it.... but it's still a damn monkey in my book !! ROFL!! It seems the monkey is near the spectators. "Can we all get along" LOL! !Cool picture!